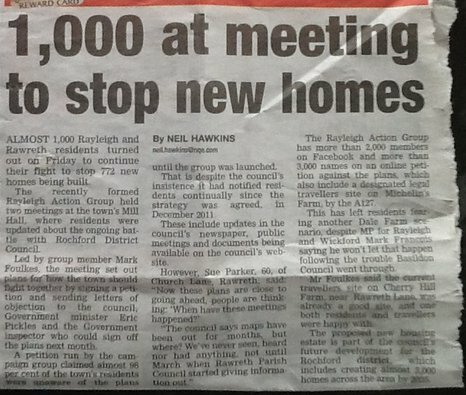 Rayleigh Action Group have been in the press recently (see below) and are attracting some attention in all the right places. With your continued support we hope to succeed. Today we have submitted the official proposal rejecting the councils plans for housing, industrial estates, recycle plant and the large mixed travellers site. 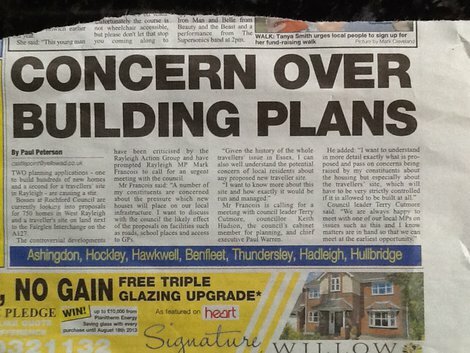 We now await the planning review on 10th Sept. Petition numbers submitted were in excess of 5000 names. Considering we only canvased West Rayleigh, that’s a big number and constitutes over 15% of the population of Rayleigh in THREE WEEKS. Stay Tuned for info on the Planned March for 7th Sept. Hundreds of people (100% of those at the last meeting) signed up to joining the march along Rayleigh High street. Let’s keep this momentum going people. ps…we are thinking about printing off T-Shirts for the day of the March. Look on Facebook and Website for more info. Estimated price of £5 per shirt.